Summary (from Amazon): Award-winning journalist Barbara Demick follows the lives of six North Korean citizens over fifteen years--a chaotic period that saw the death of Kim Il-sung, the rise to power of his son Kim Jong-il, and a devastating famine that killed one-fifth of the population. Demick brings to life what it means to be living under the most repressive totalitarian regime today--an Orwellian world the tis by choice not connected to the Internet, where displays of affection are punished, informants are rewarded, and an offhand remark can send a person to the gulag for life. Demick takes us deep inside the country, beyond the reach of the government censors, and through meticulous and sensitive reporting we see her subjects fall in love, raise families, nurture ambitions, and struggle for survival. One by one, we witness their profound, life-altering disillusionment with the government and their realization that, rather than providing them with lives of abundance, their country has betrayed them. Review: Wow. I knew things in North Korea were bad, but I had no idea just how bad they were! This book is the type of non-fiction that appeals to me, it reads like a story, but I learn along the way. 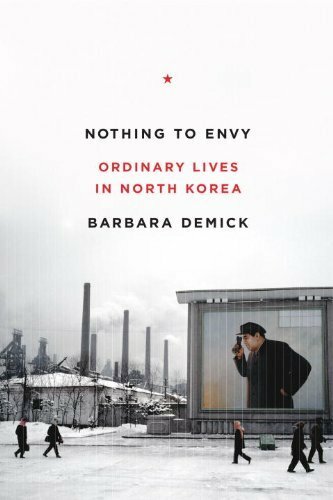 I am not really sure how to review this book since what I feel I've gotten out of it is interesting tidbits about life in North Korea so I'm making a list. The book is well written. It began as a series of newspaper articles for the LA Times, but the author got so interested in what she was finding out that she did more extensive research and interviews to make it into a book. 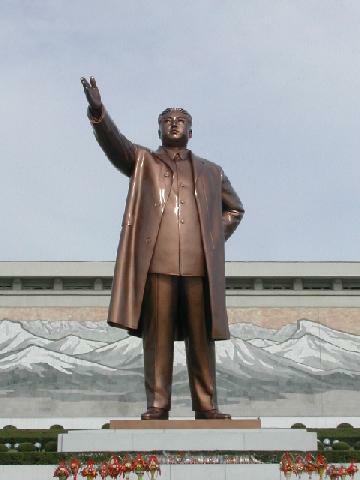 President Kim Il-sung was portrayed as God, with every detail planned out. The one "event" that sticks out for me is that each citizen is given two outfits a year: one for summer and one for winter. One of the outfits is distributed on the president's Birthday so that he seemed more benevolent and god-like. As in most totalitarian regimes, propaganda in the form of statues (see below) and billboards were used to their full advantage. As the country ran out of food for its people, they launched a billboard campaign with the slogan "Let's eat two meals a day!" Really? And this worked? North Korea has got to be the most repressive nation in the world. There is no internet, no email, no regular mail and no phone contact for regular citizens. The books, TV and movies all come from within the country. The defectors that the author interviewed said they had no idea that everyone else wasn't suffering as they were! Propaganda is an amazing thing! A nation of people can be convinced of anything if you are the sole disseminator of information. I found it fascinating to read how the six "characters" finally came to defect. Click to see my updated Google Map. Another new country before the end of the year! I have never been to either Korea and don't really know much about the countries to tell the truth. I have read one other book set in South Korea: Far From the Bamboo Grove, a book I really enjoyed, and I've read the graphic novel Pyongyang, which was also really interesting.